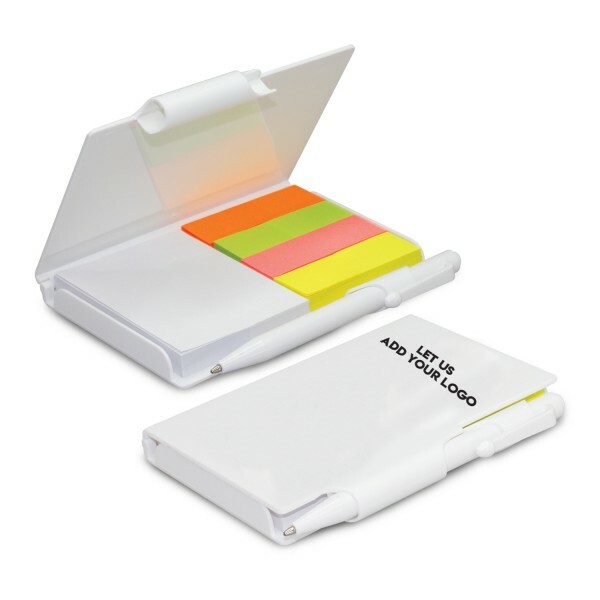 Perfect for pockets or purses, this compact notebook locks when inserted in the pen holder. There is a pad of sticky adhesive notes and a pad of sticky flags in four bright colours. If you own a supply business, book store, or stationery store, you cannot go wrong with this perfect promotional item. We are a wholesale supplier, so we deal in bulk orders and ship Australia wide. There is a standard two-week production time on this item so contact us now, especially for near events. We have a dedicated and helpful customer service department who will be glad to help place your order or answer any questions or concerns you may have. We can arrange delivery to your business address or directly to the location of your next vendor or trade show. Price excludes GST but does include 1 colour and 1 logo brand placement. There will be a $60.00 decoration fee applied to all orders. We are dedicated to excellent customer service and will do whatever we can to make it easier for you to order and receive your items. Contact us now for this and other items which may also add some pizzazz to your promotional needs.